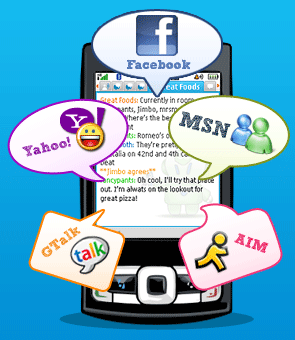 Mig33 is not only the most compatible MSN Messenger for your mobile phone, but it also let's you send Cheap International SMS and make Cheap International Calls. Mig33 is a combination of Mobile Chatrooms, Mobile MSN, and International Calling Card. And, unlike Calling Cards which require you to enter long numbers, you can launch a call cheaply and easily using your mig33 address book. Chat Rooms:Chat with anyone, anywhere and in any language inside hundreds of thousands of mig33 chat rooms on your mobile. Join an existing chat room and meet new people, or create one only for you and your friends. Best of all, the chat rooms are absolutely free! -Make cheap calls to any phone, anywhere, anytime! SMS Calls:You can make SMS calls by texting us the phone number you want to call, and wea�?ll connect you! You can even forward return calls to any phone, not just your mobile! All of this without launching the mig33 application or visiting the wap site. Qweas is providing links to mig33 4.20 as a courtesy, and makes no representations regarding mig33 or any other applications or any information related thereto. Any questions, complaints or claims regarding this application mig33 4.20 must be directed to the appropriate software vendor. You may click the publisher link of mig33 on the top of this page to get more details about the vendor.